1776 A pioneer crucible steel business was established in Attercliffe which was an early form of Naylor and Sanderson combining both cutlery and steel. The Naylors were cutlers of Coalpit Lane (now Cambridge Street) and some early Naylor and Sanderson premises were not far away, in Carver Lane. The firm went through a number of partnership changes in its early days. At one time it consisted of George Naylor, Thomas Sanderson and Daniel Brammall (or Bramall). 1822 Naylor and Sanderson, who were vigorous exporters, were in a position to take over the Swallow Works. By acquiring the Attercliffe Works on a lease from the Duke of Norfolk they gained control of a forging and rolling complex exceptionally well placed for water power and endowed with metal working traditions going back to the earliest days of iron and steel in Sheffield. Production at the original Attercliffe crucible furnaces at Oakes Green was discontinued and melting concentrated at the West Street Works. In 1820-22, significant experiments were undertaken in the manufacture of alloy steels. It is believed that this was the first commercial production of alloy steel articles. The shareholders in Sanderson Brothers and Co were now Thomas Sanderson, John Sanderson, James Sanderson and Edward Fisher Sanderson. Previously they had owned three quarters of the shares and now, by purchase, had acquired the rest of the shares from George Naylor and some minor shareholders. 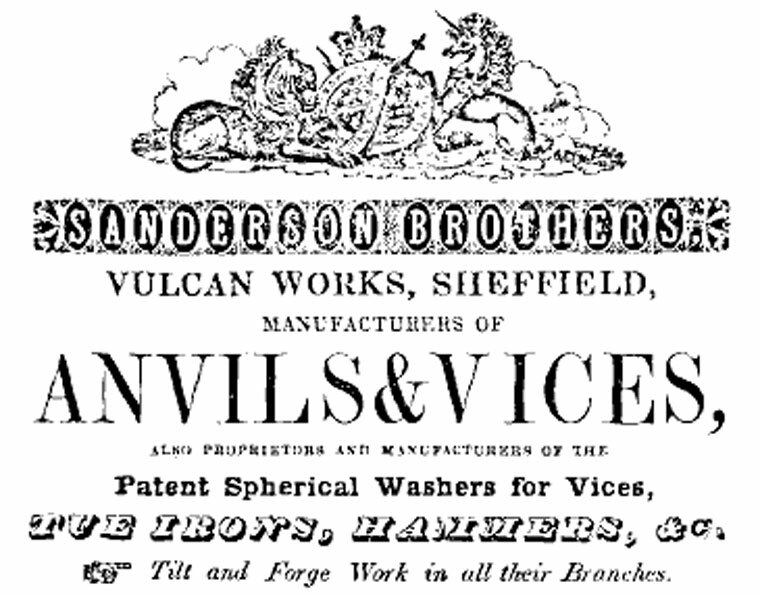 1835 Sanderson Brothers and Co took out a lease of 21 years on premises in Darnall Road from John Fisher, David Walker, and their mortgagees, at a yearly rent of £13 13s. 0d. The property had been a glasshouse and it became the genesis of the Darnall Works where the firm ultimately concentrated its steel converting and crucible melting. It is highly likely that the glass furnace was turned into a steel converting furnace, as in general form they were much the same. Both consisted of a hollow cone of brick-work open at the top. All that would be necessary would be to add the converting chests and flues. A number of new converting furnaces were, however, soon erected adjacent to the original glass furnace, together with crucible furnaces. 1836 Thomas Sanderson died on December 27, 1836. 1838 A new deed of partnership was entered into in September 1839, retrospective from October 1836. The partners were now John Sanderson, his son Edward Fisher Sanderson, James Sanderson, Henry Furniss and Edward Hudson. The latter two had married Ann and Maria respectively, the daughters of Thomas Sanderson. John Sanderson lived for a time at Darnall Hall but later occupied the New Hall, near the Works. 1843 Three corporate marks were registered with the Cutlers Company. They were Palmyra, Pitho, and Pax. All these are still registered marks of the Company today. 1848 Steam engines were in use at the Attercliffe Works by at least 1848. An old inventory shows that two beam condensing steam engines by Garforth of Dukinfield were put in during September that year. They were probably used to operate a series of tilt hammers. Steam driven hammers, including a two-ton Nasmyth-type hammer are referred to in a description of the works which appears in Pawson and Brailsford’s Guide to Sheffield published about 1860. This book also states that Messrs. Sanderson Brothers and Co. are amongst the largest as they are of the oldest manufacturers of steel, for which, with the various descriptions of files, saws, edge tools, cutlery, etc. of which they are general merchants, they have a deservedly high repute through¬out the Continent, the United States and Russia. John Sanderson’s second son Charles (1803-1873) had no partnership interest in the business. He had his own steel works in Sharrow Vale, patented many inventions relating to metal manufacture, and according to Fischer, was an able mineralogist. Well-known steel industry names associated with Sandersons included the Firths - both Mark Firth and his brother Thomas Firth, Junior gained their early training at Sandersons, Mark being on the commercial side and Thomas in the works. They left in 1842 to start their own business, in which they were eventually joined by their father, Thomas Firth, Senior who had been head melter at West Street. Edward Tozer was at Sandersons for 44 years from 1831 to 1875. He became Joint Managing Director in 1869, together with Charles Henry Halcomb. On leaving Sandersons in 1875, Tozer joined with Henry Steel and T. Hampton to take over the Phoenix Bessemer Works, which ultimately became Steel, Peech and Tozer. 1869 Sandersons was formed into a limited company on October 27, 1869. The subscribers were Henry Furniss, Edward Hudson, Charles Elam, Edward Tozer, Charles Henry Halcomb, Bernard Wake and Ebenezer Hall. Of these, the first six were appointed directors, Bernard Wake being the chairman and Edward Tozer and Charles Henry Halcomb, joint managing directors. In addition to the Darnall, Newhall Road and West Street Works, the company’s assets included stock in trade at New York, Boston, Philadelphia and New Orleans. It was very soon decided to quit the West Street Works, as that site was too built-in to admit further development. Extensions were contemplated at the Newhall Road Works but initial new development was eventually concentrated at Darnall. Additional land was acquired at Darnall and in August 1871 it was resolved to erect a new 48-hole melting furnace and sheds for coke, steelhouses. etc. 1876 A tariff wall was built by America which rendered high-quality steel made in Sheffield uncompetitive. So, on September 29, a new Company with a capital of $450,000 was formed called Sanderson Brothers Steel Co, with premises in Syracuse, New York. The manufacture of Sanderson steels was begun in America, and workmen from Sheffield were sent to the Syracuse works. .
1879 The manufacture of files at the Newhall Road works was started. Previously, Sandersons file factory had been situated in Young Street near the old Newbould works at the bottom of Sheffield Moor. 1891 A new product was introduced into the Sanderson range when the Company began the manufacture of sword bayonets. Mr. C. H. Halcomb negotiated contracts with the War Office, extensive new shops were erected and additional labour engaged for the work. Formerly the manufacture of sword bayonets in England had been confined to Enfield. The firm manufactured bayonets up to the end of the 1914-18 War. 1879 Records left by members of the firm who went out to Syracuse are still in existence. These show that a number of alloy tool steels were already being made by Sandersons both in Sheffield and America at that early date. The steels included 1.0 per cent, carbon, 1.5 per cent manganese steel of the Pitho Non-Shrink type, and a 22 per cent tungsten steel with a substantial chromium content similar to the present Kerau Wunda high-speed steel. This is termed a "self-hardening steel" in the record but it is far removed from the self-hardening steels as originally developed which had much lower tungsten. It is clear that, even in those days, Sandersons were well to the forefront in the search for improved tool steels. 1900 the American steel-manufacturing interests were relinquished and Sanderson Brothers Steel Co. was absorbed by the Crucible Steel Company of America. This page was last edited on 23 June 2017, at 06:45.